Guests to Mallie’s Sports Grill & Bar in Southgate, Michigan will stare in awe as a gargantuan, Goliath-sized burger is hauled atop a cart and then lifted by three people to a table of hungry (and bewildered) eaters. 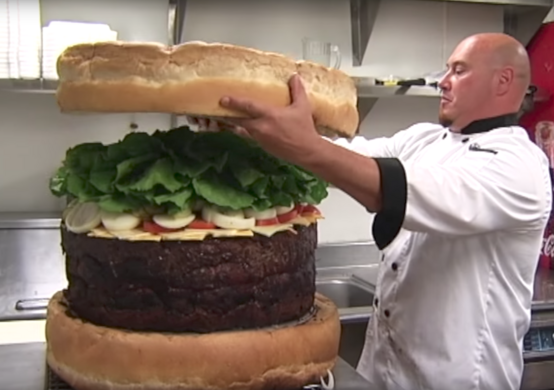 This massive meaty creation, aptly named the “Absolutely Ridiculous Burger,” holds the Guinness record for the world’s largest commercially sold hamburger, and it can be all yours for just $399. The typical Absolutely Ridiculous Burger weighs in at 150 pounds, with the official record-setter massing in at an even more whopping 338.6 pounds, double the weight of an average-sized human. The burger is so big that it takes 22 hours to make, three people to flip it over, and 100 pounds of excess grease to perfect. It’s so colossal that on an episode of Man Vs. Food, a team of 41 people couldn’t conquer the thing in a whole two hours of time. 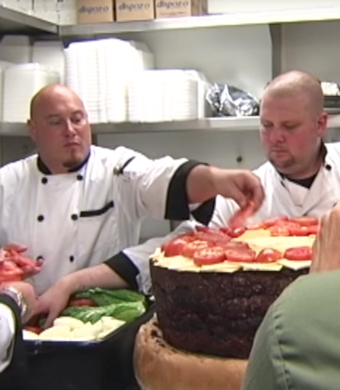 The Absolutely Ridiculous Burger is complete with 15 pounds of lettuce, 30 pounds of bacon, 30 pounds of tomatoes, and 36 pounds of cheese. You must call 72 hours in advance to order your Absolutely Ridiculous Burger. Bring paramedics.